We’d like to introduce new reviewer Taya Okerlund. Welcome, Taya! Consider Pidge, the sober-minded boy who unwittingly frees the evil Olc-Glas serpent from his prison within the pages of an old manuscript. As a consequence, Pidge is charged to recover a stone — a stone stained red with the Morrigan’s own blood. With it, Pidge can destroy Olc-Glas before he unites with the Morrigan, and foil her plans of regaining her ancient power and conquering the world. Me, lost? I never get lost. I’ve just this minute been down to the inside of the world and I met a mad earwig and we went to a battle and then I came back, and I never got lost, not even for a second. The Morrigan, Celtic goddess of war with her sister aspects Macha and Bodbh, witches of bright hair, dark powers, and black humour, with their sinister, shape-shifting hounds, track Pidge and Brigit across a parallel Ireland, the land of Tir-na-nOg. The hounds give chase, but are bound from harming the children — unless the children run in sight of them. Along their way, Pidge and Brigit encounter mythical creatures from legendary Irish faery who aid or hinder them in their quest. Ms. O’Shea published the one novel. Had she been in better health and continued writing, she would be a well read icon of children’s literature, I am sure. I sometimes wish Hayao Miyazaki had laid hold of The Hounds of the Morrigan before he retired. He would do it justice in film form and you could not fail to know it. Alas, it falls to me to tell you about it. Published in 1985. 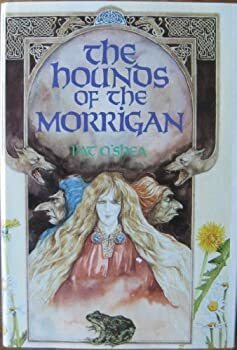 Set in the world of Irish mythology and faery tales, this story tells of the coming of the Great Queen, the Morrigan, from out of the west to free the snake and bring destruction to the world. When ten-year-old Pidge finds the crumbling pages of an old manuscript in a second-hand bookshop in Galway, he unwittingly releases the serpent Olc-Glas and the forces of good and evil gather to do battle. The Morrigan, goddess of death and destruction, has set her evil heart on gaining Olc-Glas and adding its poison to her own, thereby casting her shadow over the world. Pidge and Brigit are chosen to thwart the Morrigan, and so encounter many adventures on the way, as well as meeting an array of unforgettable characters. This is such a lovely book. I discovered it by chance many years ago and found it wonderful. More recently, I handed it to my son and he devoured it too. Something else to add to my reread list. It really is one of those irreplaceable books to our whole family, too! Welcome, Taya! Pidge sounds like a wonderful character, and I love the quote you included. And there are so many more! Thx. I’ve never even heard of this book before, and I consider myself well-read in fantasy, particularly YA and children’s fantasy. Which I suppose proves your point, Taya. I’ll have to keep an eye out for this one! You are well read. My husband read this one to me. He’s read almost everything. It may have entered into my decision to marry him. I just ordered a copy. I’m sure this is going to be a great addition to my father & son reading time :).